that is killing off our Ash trees. Its latin name is Chalara fraxinea, or fungais micrea an fhuinseog in Irish, or Microascales fungi of the ash in English. It is a fungus that breaks up into very small spores that are spread airborne more than by physical contact, just like a common cold or flu, but can travel further and quicker than cold germs. Chalara is a fungus that incubates and breeds rapidly after the conditions of a mild winter followed by a cool damps summer, and this is what Europe has just had. The visual symptoms are rapid leaf edge burning and rapid leaf drop before leaf dropping is due, combined with fissures, splits, in the branches and even the trunks. A sticky blackish gunge at branch and bud crowns is also a sign. This fungus has only recently been understood and given a name in 2006, but is now believed to have originated in 1992 in a woodland in Poland where large numbers of ashes were destroyed but the fungus not identified. Denmark recognized a huge infection in their country in 2006 where 80% of their ash trees became affected. During spring 2012 the fungus was recognized on planted young tree plants around the UK that has been imported from the Netherlands. 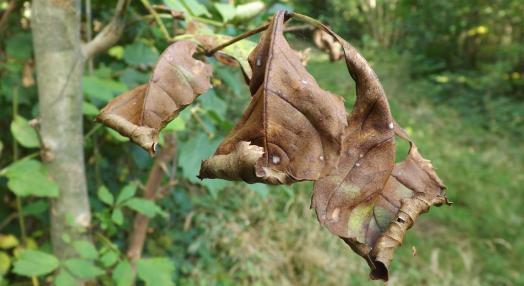 During this autumn 2012 a large number of mature ash trees in East Anglia were found with the fungus indicating that the Dutch nursery supplies did not hold much of the blame. It is now being realized that the fungus spores can travel long distances in the wind, including across the North Sea. 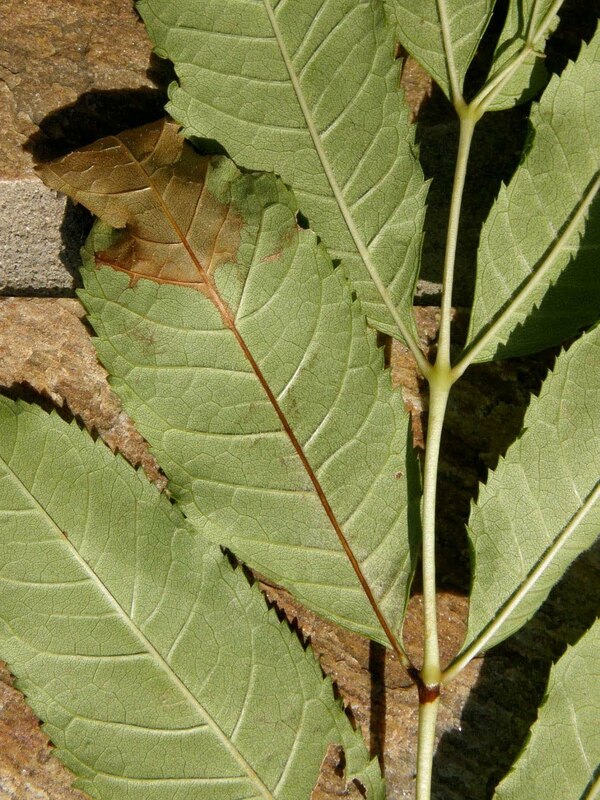 Can we save the Ash Trees? . Sadly, the short answer is that eventually probably only a few may be saved. 10 years old may survive a couple of years but are still capable of spreading the fungus spores from their leaves during the summers they are alive. but still can be summer spreaders from their leaves. 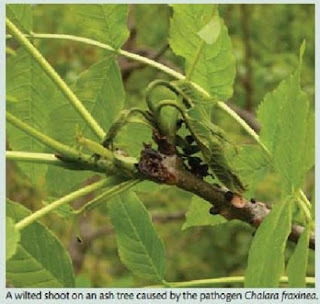 Not all species of Ash Trees are affected. Asian species seem to be immune from the fungus. There is so far no evidence of this fungus affecting other tree species. Rowan, Mountain Ash is certainly not affected at all. but do not eliminate it. Should we save the Ash Trees? Obviously we do not want to see Ash trees go but we may have to accept that this is nature's way for now. The Ash trees will be back in abundance, even if it may not be in our lifetime again. 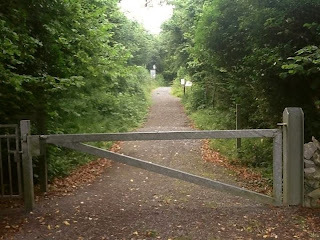 GAA clubs in Ireland will be devastated as they rely on Ash for the making of Hurleys. Hockey sticks are made from them too. This is a double blow to GAA who are also losing their team stars to emigration to Western Australia. It does seem that most uses of Ash trees can be covered by some willow species. Herbalists will disagree, though, and they are quite right. The ash tree leaves are a good diuretic that are sometime part of a herbal approach to obesity. and one day they will return again. Is this fungus disease caused by humans? It seems like this disease has come about through weather changes setting ideal conditions for it to breed and spread. Our industrial actions may contribute to weather changes it seems, but this does seem to be more like a climate change cycle. Cycles of climate change has been on this planet since ancient times, some of it very extreme even during our human population lifetime. However, I do not think there is anyone to blame or anything to gain seeking to place blame on someone or something. A lot of blame and finger pointing is being placed on the import of young Ash plants, especially Dutch imports. Some tree nursery people in Ireland tell me they find they cannot afford to compete with the Dutch factory approach of creating plants for sale at very low costs allowing big profit margins for garden and farm centres. Irish gardeners and tree planters tend to go for native species imported from foreign shores rather than buy the higher priced native grown native species. It is similar to what I hear for families shopping at Aldi and Lidl supermarkets rather than support local farmer's markets and farm shops. The blame on imported plants, especially from the Netherlands, is well diluted now that it is discovered that the spores travel abundantly long distances in wind. Even so, I feel we should not buy imported plants for other important reasons so a tree plant import ban could be a very good thing. Overall, the fungus pores are spread airborne lifted from Ash leaves between June and September. By the time leaves fall and we and our dogs walk on them, the spores have already left the leaves. The likelihood of our feet, paws and clothes spreading the fungus pores is very slim. Also, just a few fungus pores do not infect an Ash tree. An Ash tree has to be invaded by a good accumulation of Chalara spores for the disease to start being destructive to the tree. Birds are more likely to spread the pores from their feet and feathers than we ever could do from our feet and body clothes. .
Having said that, a good washing of shoes, boots and clothes after being in a wood is good practice to reduce all disease and pest transfer. 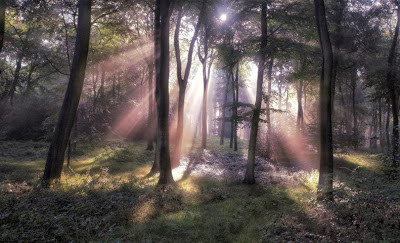 The important thing, is not to stop going into the woods due to fear of you spreading a disease. The most important thing is to visit woodlands, seek out Ash trees, old, young and seedling, observe them, and report anything you feel is suspect. Monitoring what is happening can help with management decisions as we just do not know how much of the Ash population this will eliminate. Attempt at protection and trying to stop this is worthwhile. Identification of Dieback is much easier when Ash is in leaf, but of course Ash is the tree with the shortest leaf season. 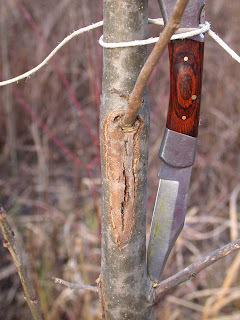 Trunks and branches with fissures, with splits, can be tell tale signs through winter though.